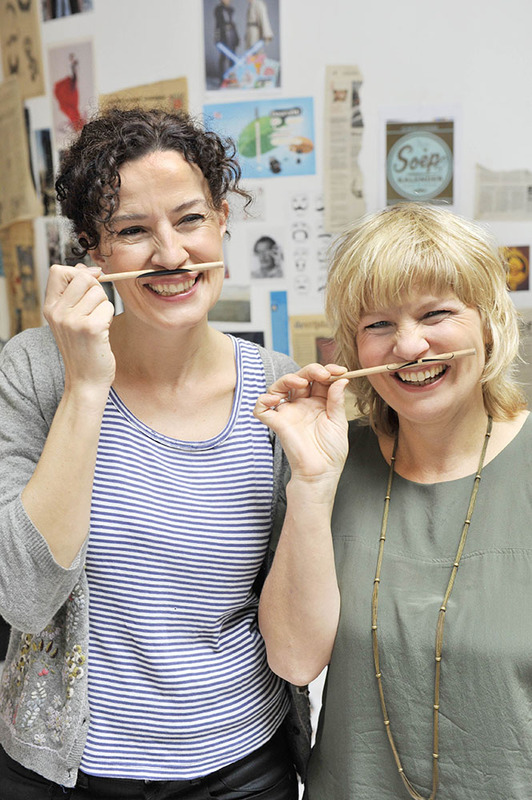 Introducing Annemarieke Piers (left above) and Claudette Halkes (right above)—the dynamic duo behind Snor Publishing House! In case you were wondering, “snor” in Dutch translates to “mustache” in English. 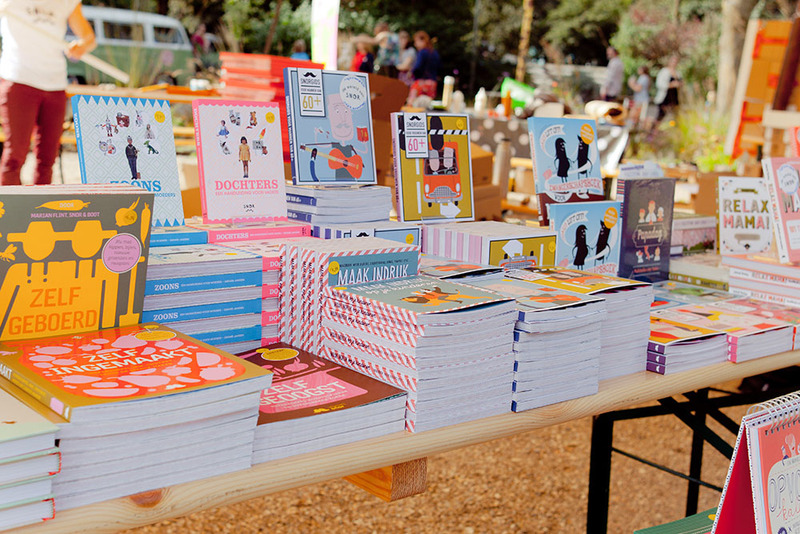 Based in Utrecht, Netherlands, they’ve published about 50 titles in seven languages, some of them being memorable Knock Knock titles: 99 Pick-Me-Ups For New Mamas, Little Philosophers, Big Questions, Pregnancy Book for Men, In the Backseat: An On-the-Road Vacation Fun Book, Vouchers for Women, Dear Mom Activity Book, Dear Dad Activity Book, and Cheerful in 100 Days. Having written books for other publishers in the past, Annemarieke’s and Claudette’s first book was about cleaning and was a huge success in the Netherlands. They continued to make more books and had the idea for a handcrafting book (on sewing, cross-stitching, etc. ), but unfortunately, no publisher was interested at the time (bet they’re kicking themselves in the head now!). They decided to take matters into their own hands and Snor was born! Nowadays they crank out 15-18 books a year with just a team of six people. Impressive! They recently won the Gourmand Cookbook Awards in China for “The Best BBQ Book in the World 2014” for their title, On Fire! The Big BBQ Book for Women, by author Charlotte Fielmich. 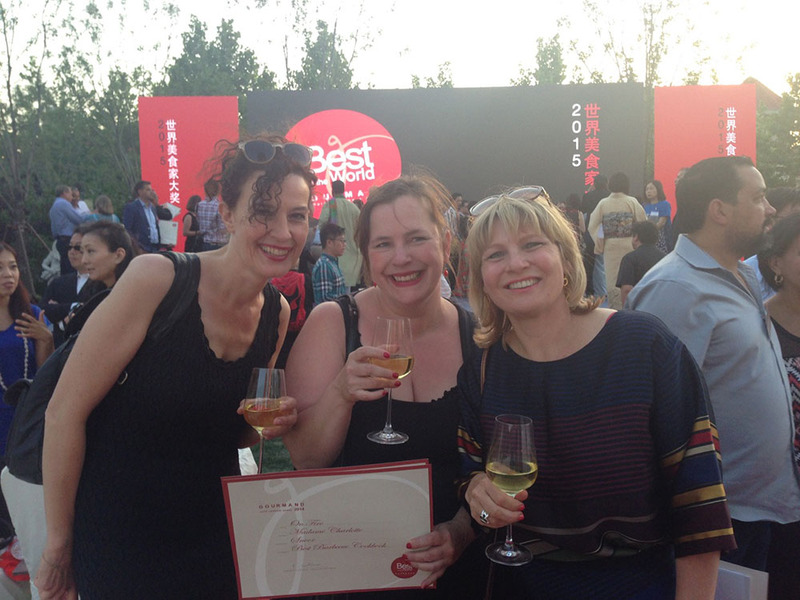 (Left to right) Annemarieke, Charlotte, and Claudette celebrating their award for the 2014 Best BBQ Book in the World with a glass of wine. Given their success and our collaborations, we knew we had to learn more about Annemarieke and Claudette. Check out the Q&A below! 1. 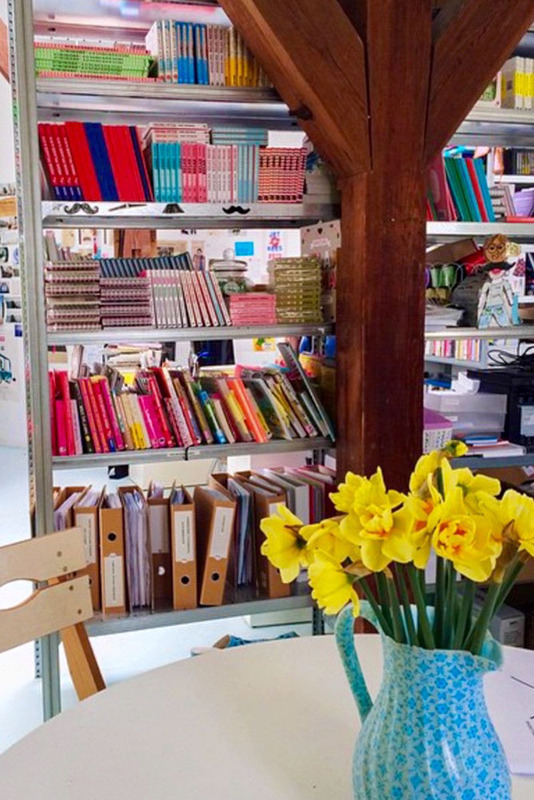 As a pair who runs a publishing house, what’s a typical day like for you? We start with coffee and a lot of talking. Then we answer e-mails, get more coffee and, in between, we talk a little bit more and by then it’s lunchtime. We always make a big deal about that—an enormous salad with salmon, spices, tomatoes, beans, and so on. Good ideas come in healthy bodies. Most of the time Claudette’s cell phone will ring a couple of times and, in between, we try to think of some marketing ideas, great ideas for new books, and answer more e-mails. We also have a meeting with someone about something. A little peek inside the Snor Publishing House office. 2. Where do you find creative inspiration for your books? We have no idea. We don’t do anything special to get inspired. Of course, we spend a lot of time on Pinterest, read magazines, and visit museums. 3. Your team strives to incorporate creativity and fun into your work and everyday life. What kind of relaxation tips do you have for de-stressing? Running and meditation, but more often you can find us drinking and enjoying the good life. 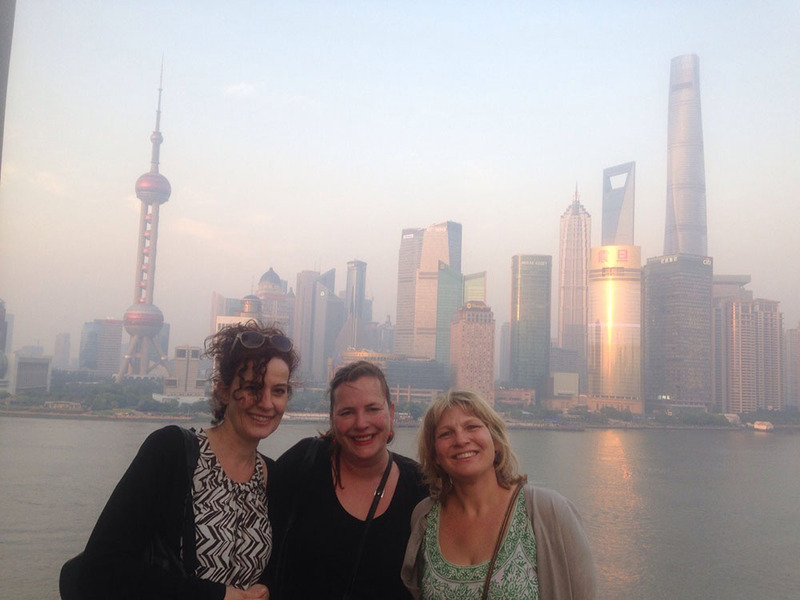 (Left to right) Annemarieke, Charlotte, and Claudette taking in the amazing sights in Shanghai, China, before going to Yantai, where the ceremony was held for the Gourmand Cookbook Awards. 4. What advice did you wish someone gave you when you became a parent? Get some sleep. 5. What’s a funny memory you’ve had so far as moms? A: We have a lot of funny memories—like when my sons put black paint on the walls because they saw a movie where the main character did that as well. Or when they fell in love with a frog, called him “Frog Bob,” and took him inside the house like a real pet. C: When my son (9 years old back then) got me a surprise: he mail-ordered some free mummy stuff (incontinency slips), or when my daughter put makeup on herself and her friend with permanent markers. 6. Hobbies outside of work? A: I like to read home-and-garden-type magazines, rearrange the house, and buy flowers. I like gardening and really like to draw. Right now I’m into making art journals with my daughter. C: I like to read and cook, and sit in the sun and watch my husband garden. I also love to buy flowers, especially on Saturday at the flower market in Utrecht. 7. What is one random fact about you that no one necessarily knows? A: I have the ugliest feet in the world. C: I (used to) play clarinet. 8. What’s your favorite Knock Knock product and why? The Someday Mini Sticky Set! We are trying to get things even more organized over here, and this mini sticky set would help us a lot! 9. What are 5 things on your bucket list right now? To answer your questions, get some coffee, and enjoy the sun. Claudette Halkes (left) and Annemarieke Piers (right). Snor Publishing House will be having its second annual Snor Festival on September 20, 2015. 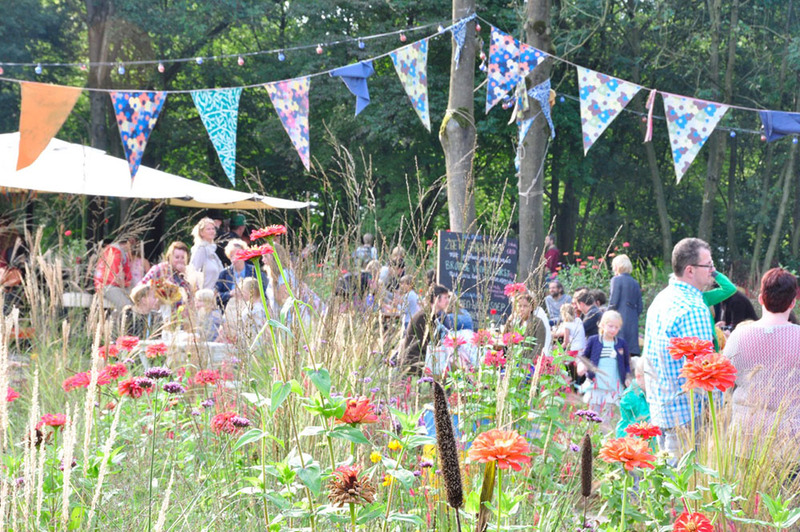 Located in a campsite near Utrecht, Netherlands, Snor Festival will have fun, creative workshops, food, music, and a book launch. 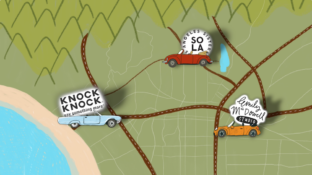 If you’ll be in their neck of the woods come September, tickets can be bought here and check out their video showcasing last year’s first Snor Festival here. The first Snor Festival was held last year and was a great success—expecting only 300 attendees, but had 1,200! For more information on Snor Publishing House, visit their website or follow them on Facebook, Twitter, Instagram, and Pinterest.